Use Sugar Campaigns to streamline the development, execution and monitoring of your campaigns across multiple channels. Build detailed views into campaign effectiveness across marketing and sales stages. Define campaign routing and approvals to ensure visibility, alignment and execution across your organization. Benchmark campaign effectiveness to quickly identify what is working and what is not delivering the results. 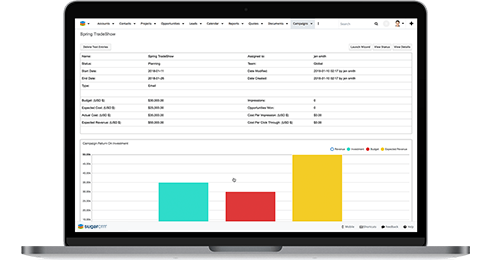 Sugar Campaign Wizard simplifies campaign design, execution and tracking of a campaign. Campaign Wizard gathers granular information so you can measure your campaigns. Get real-time activity updates. Use Sugar’s Web-To-Lead Form to easily capture your website visitors’ information and store them as Leads. Reduces dependency on IT support with the Web-To-Lead form that is easy to use even for a non-technical user.